It’s 5:15 on a dark, chilly late-March morning, but Belmont Park is wide awake. At the track where Man o’ War and Secretariat set records, horses are already lined up for their morning workouts. Exercise riders, grooms and trainers talk easily in Spanish and English. Roosters crow faintly. Behind the wheel of his muddy Land Rover, Russell Cohen, V87, is ready to roll. 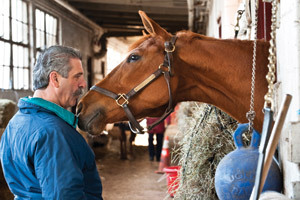 He is one of a half-dozen private veterinarians based in Belmont’s “vet village” who care for the horses stabled at the Long Island, N.Y., track. With his handlebar moustache and nonstop jests, Cohen stands out, even in the Runyonesque world of Thoroughbred horse racing. Belmont’s backstretch is home to 61 barns with 2,200 stalls. Like a circus, it’s a tight-knit community, with a hospital, kitchen and housing for workers as well as animals. Cohen going nose to nose with Distant Sky, a 7-year-old Chestnut gelding. Photo: Alonso Nichols. Cohen gives yield signs and curbs minimal deference as he drives from barn to barn, his cell phone ringing constantly. A woman named Tammy, an owner, trainer, breeder and exercise rider, totes a big stock pot. Each morning she cooks up a batch of oats, apples and carrots for her charges—chicken soup for the racehorse’s soul. March is Belmont’s quiet season. Racing at the track, which is home to the last jewel of the Triple Crown, the Belmont Stakes, doesn’t start until April 26. Its most talented residents winter in Florida at Gulfstream Park. 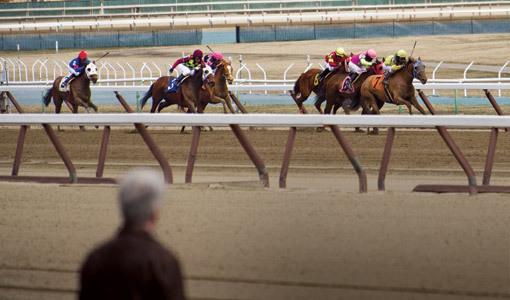 Less-competitive horses remain in New York and are vanned to race at nearby Aqueduct, where Cohen also has clients. Cohen is calm and efficient in dealing with his 1,000-pound patients. Beautiful Risk, a 5-year-old bay wearing a plaid blanket and maroon leg wraps, stands quietly as he slides an intravenous drip into her neck. Two liters of Ringer’s solution will replenish electrolytes lost during her morning work. Keeping these equine athletes healthy involves their mental as well as physical needs. Outside each stall hangs a bundle of hay, which satisfies the horse’s need to munch, and a big “Jolly” ball that functions as an equine punching bag. Goats are favored to calm nervous horses, and one (reputed to be faster than some horses in the barn) butts heads with its equine companion; another ambles over to Cohen for a scratch. Cohen landed at the track almost accidentally. Born in the Bronx, the son of a produce wholesaler, he grew up in New Jersey in a family surrounded by pets. He studied biology at Michigan State (Magic Johnson was a student there at the time) and Hofstra University before heading to Texas to pursue a master’s degree in population genetics. “I was a Jewish boy from the Bronx at Texas A&M, a Baptist school,” he notes. “It was very entertaining.” Cohen had been accepted to Tufts’ veterinary school and was planning to defer his enrollment, when his father made him an offer he couldn’t refuse: “Go to vet school now, and I’ll pay. Wait, and you pay.” So Cohen headed to Massachusetts and finished his master’s during his first year of vet school. He relished his clinical rotations in Tufts’ Hospital for Large Animals and an internship at the Bronx Zoo, where he hoped to work after graduation, but there were no openings. Eager to return to New York City and to practice with large animals, Cohen began cold-calling every equine veterinary practice near the Big Apple. He struck gold when he landed a job at Belmont with the renowned Thoroughbred breeder and veterinarian William O. Reed. Eighteen months later, Cohen started his own racetrack practice. Over the past 25 years, he has worked with such horses as Kentucky Derby and Preakness winner Alysheba and Breeders’ Cup Classic victor Proud Truth, as well as some of the best trainers in the business. A tall man with bright blue eyes and trademark newsboy cap, Turner conditioned 1977 Triple Crown winner Seattle Slew. He is one of a select group of trainers whom Cohen holds in high esteem for his horsemanship and integrity. The overuse of drugs has resulted in generations of what Cohen calls “fraudulent” horses. While legal, medications such as Lasix, a diuretic prescribed for respiratory bleeding that many believe enhances performance, mask problems that show up in the next generation. Breeding marginal stock in an attempt to make a quick profit has further contributed to the deterioration of Thoroughbred horses, he says. Fortunately, things are heading in the right direction, according to Cohen. A tougher economy has helped decrease the annual U.S. foal crop from 40,000 to 22,000. In the wake of pressure from the public, Congress, state regulators and horsemen and horsewomen themselves, Cohen believes that uniform national medication policies, modeled on New York’s stringent standards, will soon replace existing patchwork state regulations. Overmedication notwithstanding, advances in equine veterinary medicine have produced huge benefits for these animal athletes and the industry. New, more sophisticated imaging technology helps trainers identify problems before they become serious. “They can stop training before a terrible injury occurs,” Cohen says. Modern techniques also mean that “there are few severe orthopedic injuries that can’t be fixed,” he says, pointing to more refined arthroscopic procedures; internal and external fixation techniques involving screws, pins and plates; lightweight casts; newer anesthetics and better recovery facilities. Although survival rates vary depending on the injury—and treatment can be costly—a broken leg, for example, no longer means automatic euthanasia. And injured horses can learn new vocations. Cohen’s patients include former racers retrained as therapy horses for children and adults with physical and mental challenges. One retiree, Oh How We Danced, occupies a special place in Cohen’s heart. He bought her following a career-ending ankle fracture, and she became a successful broodmare, foaling Double Dees, the 1996 New York champion 3-year-old filly. Now age 29—that’s about 90 in human years—Oh How We Danced, the only horse Cohen owns, lives on a farm in New York. “She’s my responsibility, and I take care of her,” he says. Cohen sometimes consults with equine experts at the Cummings School on his difficult cases and talks with Tufts students about the 24/7 job from which he’s never taken a day’s vacation. Kim Thurler, the director of public relations at Tufts University and a follower of Thoroughbred racing, can be reached at kim.thurler@tufts.edu.